Gamma Correction: What is it? Why is it needed? Link Posted: Thu Sep 27, 2007 6:56 pm Post subject: Gamma Correction: What is it? Why is it needed? More and more home theater devices are offering gamma correction circuitry. Many of Crescendo-Systems products such as the RTC2200 Component to RGB transcoder now feature a user adjustable Gamma Correction circuit built in. Gamma correction is an essential component to reproducing the best possible image possible. Without gamma correction, dark details (ie: shadow detail) in your projected image will lack detail or simply be missing. An adjustable gamma boost is used to restore shadow detail. 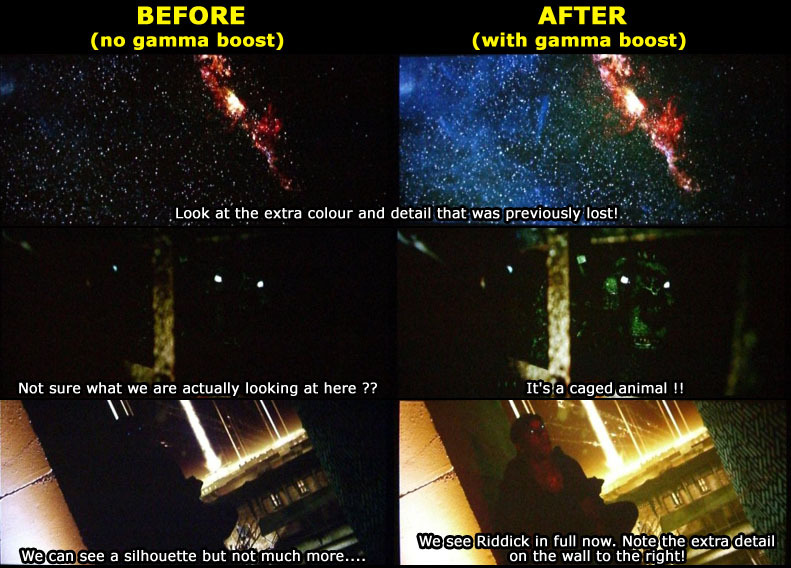 If you've always found movies too dark or missing detail in dark scenes, you need a gamma boost! So what does gamma boost actually look like? So what exactly is gamma correction? What does it do? Why would I need it? Gamma correction is a manipulation to the contrast of the display signal to correct for the fact that the intensity displayed on a CRTs and other displays is not linearly related to the input voltage. In other words: Without gamma correction, dark areas in picture will simply look too dark or black. A gamma boost corrects for this by increasing the contrast in the darker areas without affecting the overall black level of the picture. Can't I just increase the brightness setting on my projector? No. Your brightness setting should be set such that a true black signal looks black. If you increase your projector's brightness setting you will see more dark area detail but blacks will also look grey. Gamma correction works as it doesn't affect the low end 'true black' signal. This is still considerably better than an uncompensated curve. Support our site by using our affiliate links. We thank you!